Our Deluxe Pontoons boats (12 passengers) are $190 for 2 hours, $275 for 1/2 day (3-4 hours), 450 for the full day. 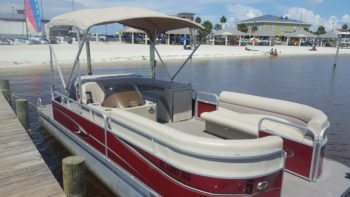 All pontoon rentals are + fuel and tax fuel is $4 per gallon. We just scan a credit card for deposit and you pay however you like when you return. Rental times are typically 10-2 or 2-6. You can also rent it for the full day from 10-6. As soon as you know exactly when you want to do it make the reservations as this time of year the boats fill up fast. Also they are fuel efficient 4 stroke 115 HP engines and we charge for the fuel you use at a rate of $4.00 per gal. Those wishing to drive that are born Jan/1/1988 or after are required to take a boaters safety course. We offer the course here at our shop for $3.00 or you can take the course on-line at http://www.boatus.org/onlinecourse/watercraftcourse.htm for free, just print out the certificate of completion and bring in with you along with a photo identification. Choose Deluxe pontoon boat rental date and time below. Dates with available pontoon boat rentals are shown in green, click a date and then choose a morning or afternoon rental. 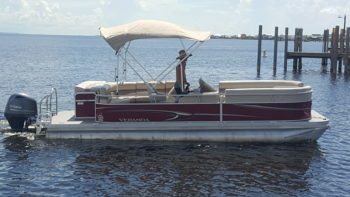 NOTE: Two hour pontoon boat rentals are not available for advanced online reservations, call us at (877) 932-7272 if you only want a boat for a couple of hours.